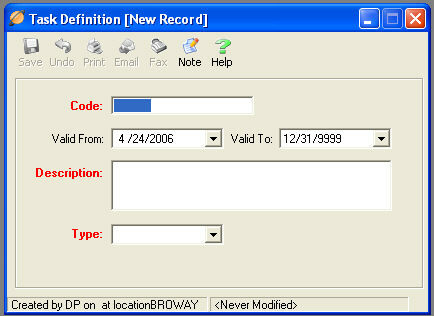 The Task Definition gives information and direction to the TeleTracker Online user when they open a Task. All items marked in RED are required fields and must be populated before the Task Definition can be saved. Code : Enter a Code for the Task Definition. The Code cannot contain any spaces or special characters. Valid From / Valid To : Select the appropriate dates for which the Task Definition will be valid. Description : Enter important information relating to the task you wish the user to perform or a description of what the task defines. Example 1: "The customer's contract period will expire in 5 days. Check the Renewal Activation Specials sheet. Contact the customer and inform them of the specials." Example 2: "This callback is pending. Initial contact was attempted - Customer did not answer phone." Type : The Type field identifies what kind of Task Definition you are creating. Contact: Select the Contact Type for initial contacts with customers. Pending: Identifies that actions have been taken, but the task has yet to be completed. Complete: Identifies that the task is complete and no further action will be taken.